Fairsands is at the centre of Portreath village but with a tucked away feel and with the beach, shops, pubs and cafe all accessible in under a minute's level walk. 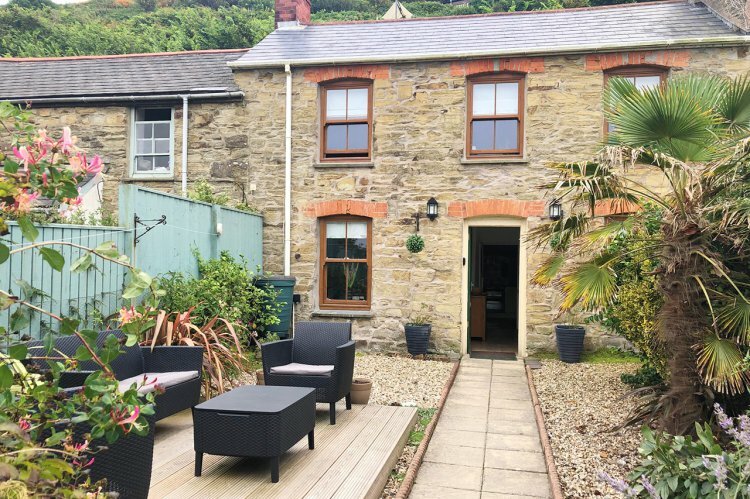 This former miner's cottage has been modernised with electric heaters and WiFi as well as being tastefully decorated and fitted with quality furniture throughout, making this a very comfortable seaside retreat. Featuring a beautiful enclosed garden at the front and a small sun room at the rear; perfect for enjoying the sun with a bit of privacy. Portreath's centrepiece is the pretty sandy beach which is well supported by several shops, cafés and pubs. The nearest town is no more than a 10 minute drive for supermarkets and takeaways. From Portreath you can walk for miles on the coast paths, cycle the old tram-ways and also nearby is Tehidy Country Park, with 250 acres of woodland to explore. Entered into the dining area, which has the living room and kitchen off, there's a dining table with 6 chairs and an electric fire effect stove. The fully fitted kitchen has electric oven and 4-ring hob, microwave, dishwasher, fridge/freezer and washer dryer. The living room is comfortably furnished with 2 sofas, oak furniture and an LCD TV/DVD. Attached to the kitchen is a sun room with two seats which opens to a small outdoor walkway which shouldn't be used but keys to the door are provided should you need to access it. A staircase leads to the first floor to a small landing with bedrooms and bathroom off. The master bedroom is a double room with 5' king-size bed, bedside tables with lamps, triple wardrobe, chest of drawers and TV. The second bedroom has twin 3' beds, bedside tables with lamps, triple wardrobe and chest of drawers. The family bathroom has a bath with electric shower over, handbasin, toilet and heated towel rail. The enclosed front garden is well-equipped, featuring a decked area with garden furniture for dining al fresco or an afternoon read in the sun. There's also a shed which can be used for storage of bikes and beach equipment. From the end of the garden you can walk to the shops, pub and beach within a minute! Heating throughout is by modern electric thermostat heaters. Electricity, bedlinen and towels are all included and two small /medium size dogs are welcome at £25 per dog per week. There's parking for two cars on a private gravel drive at the front of the garden.